Keep SharePoint clean and perform on-demand or scheduled scans of objects within the SharePoint database. Set up rules on file name, file size and real file type. Speed up scans by only checking files that are not excluded. Provides all the tools for fully-fledged server protection, including the resident shield and on-demand scanning. Prevents malicious threats and unauthorized users from disabling the security of the system. The advanced ThreatSense® technology combines speed, accuracy and minimal system impact. Eliminates malware targeting Windows, Mac, and Linux, and prevents threats from spreading from one platform to another. Automatically detects server roles and installed software to exclude critical server files from on-access scanning to decrease overhead. Provides identification of the user logged in at the time the infiltration was detected for easier tracking of the source of infection. 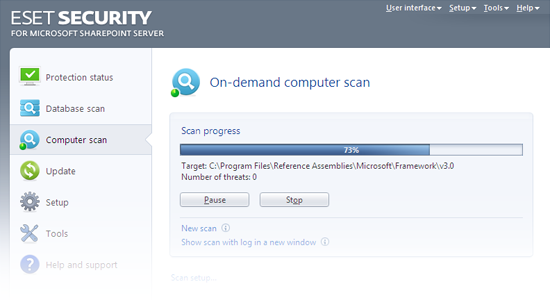 Protect the program against unauthorized uninstallation and prevent unwanted changes of security settings.